The ultimate goal of adding a lemon to a beer is to hide beer flaws and defects. By using a transparent bottle, ultraviolet (UV) rays oxidise the beer very quickly, causing a bad taste and decreasing its smell. 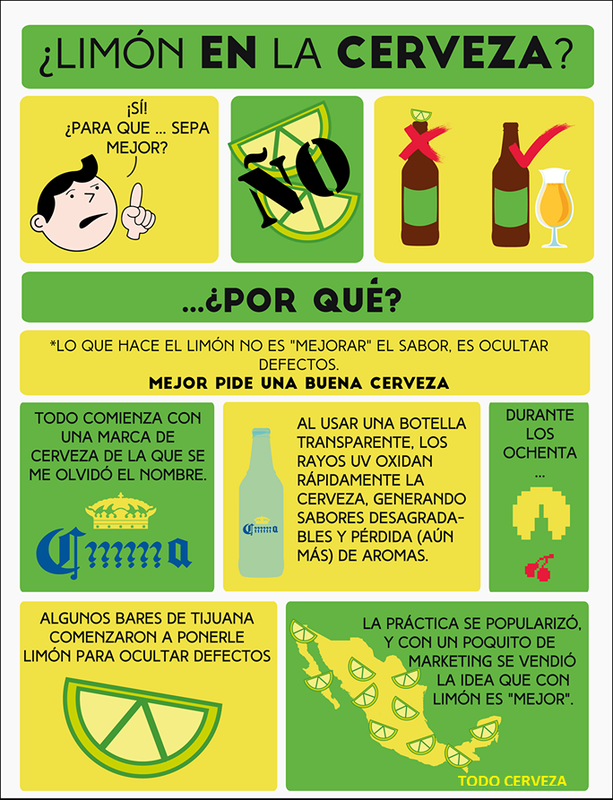 Some Tijuana bars started to adding a lemon to cover these defects and marketing ended up making a famous brand (C****a) popular to be used with lemon. So you should avoid beers that need lemons to taste good. *Translated from this pic in Spanish. Besides the source of information does not seem to be very reliable, most beers come in dark bottles, so may be there is something true about it? Skunky-smelling compounds (3-methylbut-2-ene-1-thiol) are formed in beer due to sunlight breaking down alpha acids in hops (flavoring and stability agent in beer) that react with sulfur. These compounds are chemically similar to the chemical compounds that's found in spray produced by skunks against predators. Brown bottles filter out visible and ultraviolet light that are known to cause a "skunky" reaction. Some brands such as Corona retain the skunky flavor and others use a stabilized hop extract which does not lead to the MBT production and thus can be stored in clear bottles. Amber bottles block much of the wavelengths of light (~300-500nm) that lead to this photoxidation but green and clear bottles do not. Corona IS skunky … this is why they serve it often with a lime to mask the smell. Also, the ‘skunkiness’ has become accepted in Corona as just part of the flavor. Some of the macrobrew companies (Miller-Coors etc) use a hop extract that has been stabilized so that light will not lead to MBT production. Therefore they can use clear bottles without worry. Since the MBT is derived from hop components, different beers with different amounts or types of hops may lead to varying levels of light induced MBT. Source: Physics and Green Beer Bottles. Beer is also stored in green bottles for branding and marketing purposes. TL;DR: Modern glass suppliers are able to apply clear, UV protected coating to glass that stores fresh beer no matter what kind of colored bottle it is in. Not the answer you're looking for? Browse other questions tagged chemistry beer taste .